mation within the pores of the HA construct. 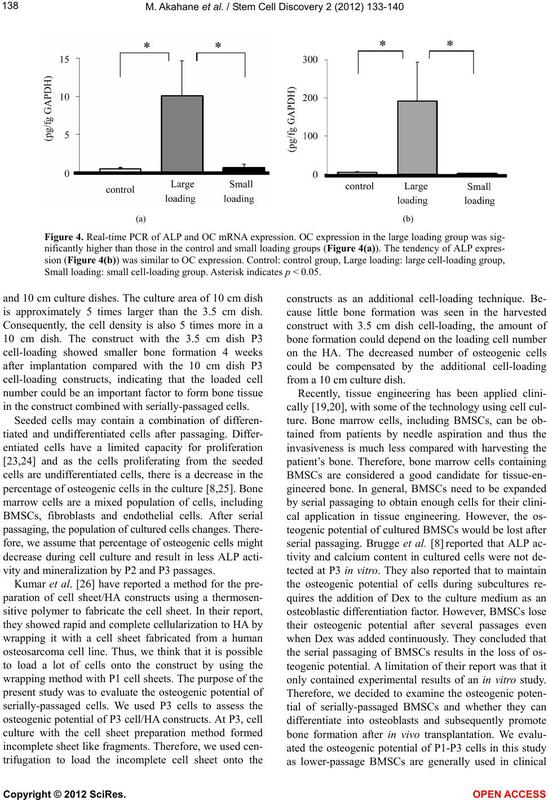 BMSCs is increased by additional cell-loading. cells known as mesenchymal stem cells (MSCs) [1,2]. acid phosphate and transplanted as cell sheets . tum using trypsin/EDTA (Gibco, Invitrogen, CA, USA). measure ALP activity, as previously reported . ment was performed in duplicate. rats for the control group of the in vivo experiments. study (Cellyard HA scaffold, Pentax Co., Tokyo, Japan). they were cultured in 3.5 cm or 10 cm dishes. were implanted at subcutaneous sites on their backs. (Falma Co., Tokyo, Japan) and embedded in paraffin. tension. This experiment was performed in duplicate. which were standardized to DNA content in each group. 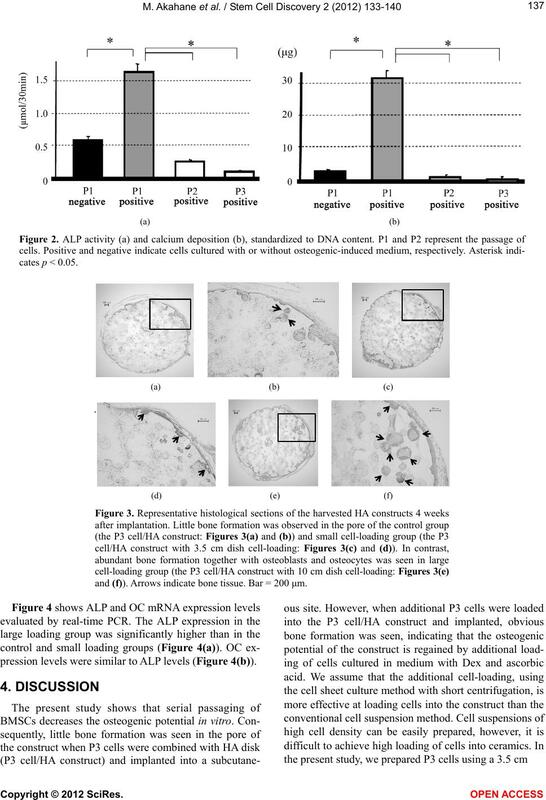 osteoblastic phenotype of cultured cells (Figure 2(a)). neralized nodule in P2 cells appears smaller than P1 cells. for ALP and Alizarin Red S staining. the harvested HA constructs 4 weeks after implantation. 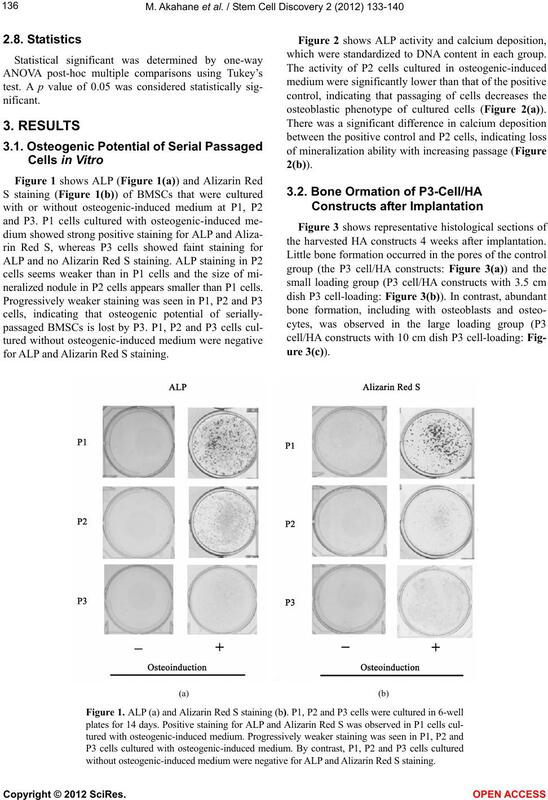 without osteogenic-induced medium were negative for ALP and Alizarin Red S staining. and (f)). Arrows indicate bone tissue. Bar = 200 μm. pression levels were similar to ALP levels (Figure 4(b)). Small loading: small cell-loading group. Asterisk indicates p < 0.05.
is approximately 5 times larger than the 3.5 cm dish. in the construct combined with serially-passaged cells. vity and mineralization by P2 and P3 passages. from a 10 cm culture dish. only contained experimental results of an in vitro study. applications for tissue-engineered bone reconstruction. preparation of cell sheets formed incomplete sheets at P3. be tested to confirm our results. such as HA and β-TCP. University School of Medicine, Japan) for their technical assistance. 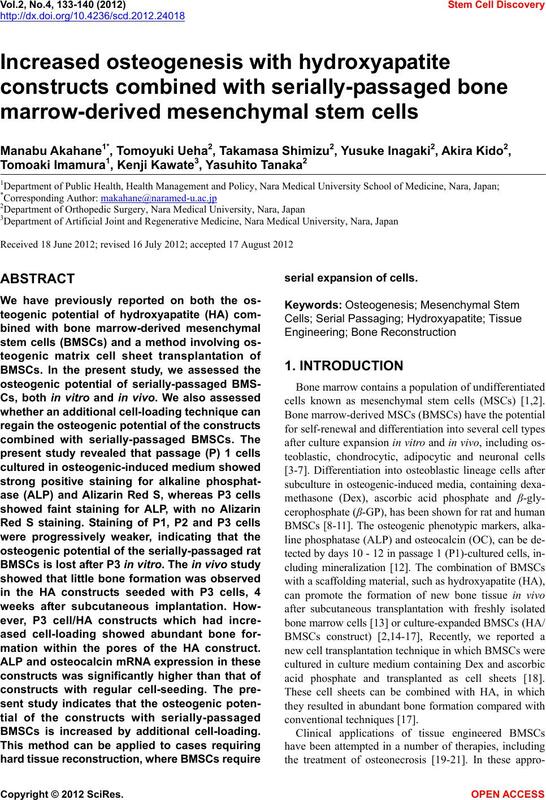 This study was supported by Takeda Science Foundation. of Biomedical Materials Research, 48, 913-927.
nal of Biomedical Materials Research, 44, 381-388. Sonal, R., Jackson, J.D., Brusnahan, S.K., O’Kane, B. J.
cells. 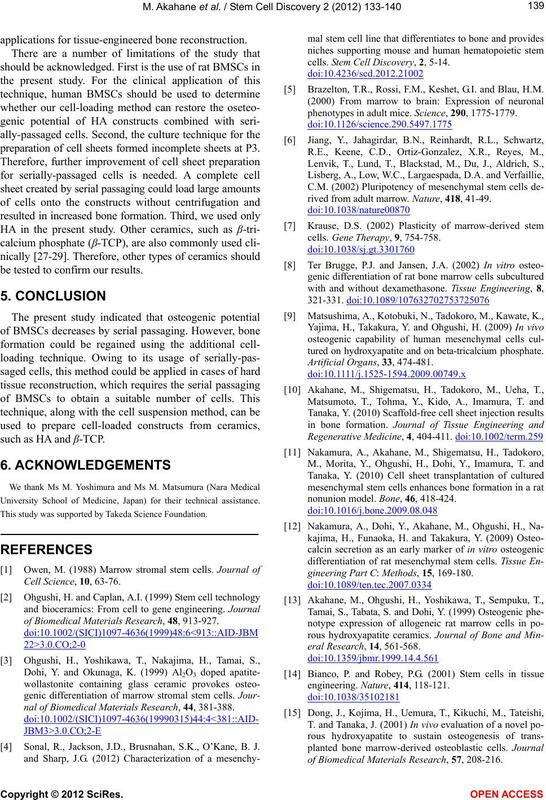 Stem Cell Discovery, 2, 5-14. Brazelton, T.R., Rossi, F.M., Keshet, G.I. and Blau, H.M.
phenotypes in adult mice. Science, 290, 1775-1779.
rived from adult marrow. Nature, 418, 41-49.
cells. Gene Therapy, 9, 754-758.
tured on hydroxyapatite and on beta-tricalcium phosphate. nonunion model. Bone, 46, 418-424.
gineering Part C: Methods, 15, 169-180.
of Biomedical Materials Research, 57, 208-216.
lemin, G. (2000) Tissue-engineered bone regeneration. teoarthritis and Cartilage, 10, 199-206.
fibula. Artifical Organs, 30, 960-962. Omokawa, S., Kawate, K., Imamura, T. and Y. Tanaka. supply. 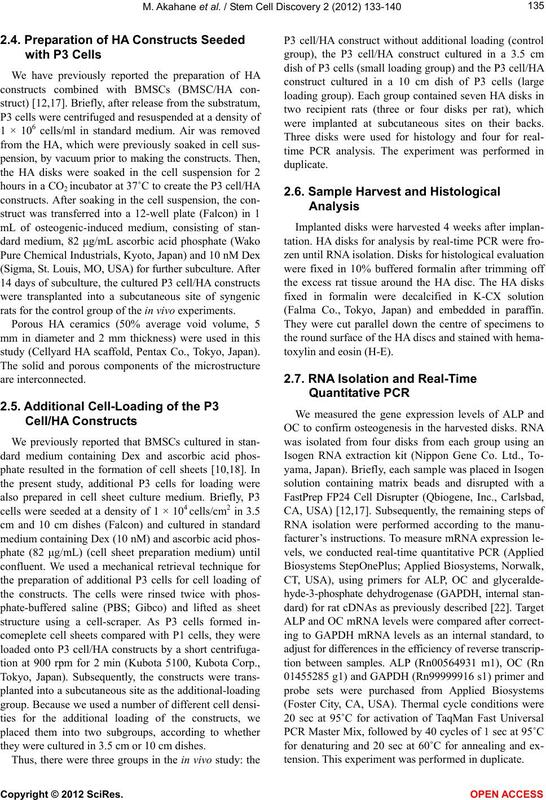 International Journal of Stem Cells, 3, 138-143.
newal in culture. Blood, 77, 1906-1911. Aubin, J.E. 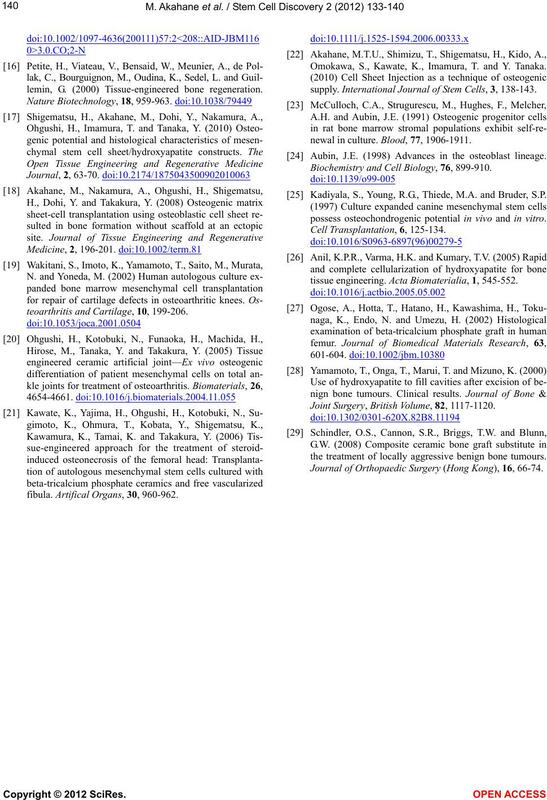 (1998) Advances in the osteoblast lineage. Biochemistry and Cell Biology, 76, 899-910. Kadiyala, S., Young, R.G., Thiede, M.A. and Bruder, S.P. possess osteochondrogenic potential in vivo and in vitro. tissue engineering. Acta Biomaterialia, 1, 545-552. Joint Surgery, British Volume, 82, 1117-1120.
the treatment of locally aggressive benign bone tumours. Journal of Orthopaedic Surgery (Hong Kong), 16, 66-74.